В своей работе Brinstaar и Bred Blondie оттолкнулись от самого очевидного: работа художника с камнем. Как художники, учитывая форму куска гранита, не преодолевают её, а взаимодействуют с ней, и в результате она становится со-участником последующего произведения, так и в аудио-сопровождении: звуковая “тема" гранита соединяется с музыкальной “темой" работы с камнем. Так получился «drone», плавно изменяющийся звук, который мы слышим. Когда эта часть была готова, началась работа со звуком непосредственно создания скульптуры и консолидации звукового сопровождения. In their work Brinstaar and Bred Blondie started out from the most obvious thing: the work of the artist with the stone. 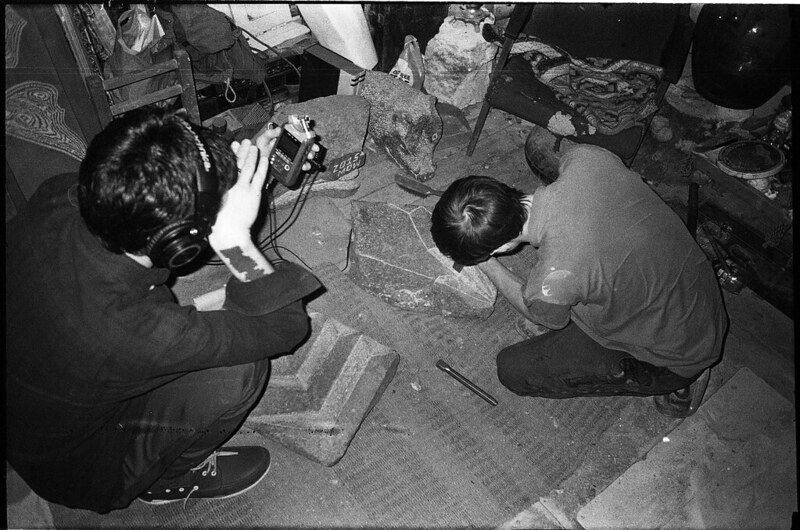 Just as well as the artists, taking into account the shape of a piece of granite, not overcome it but interact with it, and as a result it becomes a co-participant in subsequent works, the same is in the audio accompaniment: sound “theme” of granite is connected with musical “theme” of stone carving. “I took the composition of granite, with which operates 0331c and Grisha, and broke it down into elements. There turned out about 11 compounds that enter into the composition of the stone in different proportions: some consist 70%, some – 3%, some – 0.12%... The spectral lines of emission of each element correspond to the spectrum of the sound of drone loops. The modulation amplitude of the sound is dependent on the percentage of the element in the stone.” In such a way appeared “drone”, gradually changing sound that we hear. When this part was finished, there began work on the sound directly of the creation of sculptures and consolidation of sound.